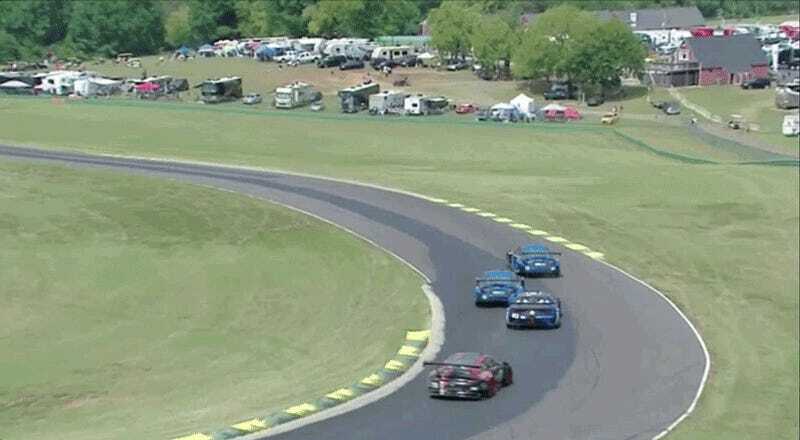 Sage Karam really wanted to keep his position ahead of Katherine Legge during today’s WeatherTech Sports Car Championship race at Virginia International Raceway. So much so that he not only bump-blocked Legge as she tried to pass, but brake checked her twice, causing an incredible hood failure. No. 14 Lexus driver Karam, and No. 93 Acura driver Legge giving each other as little room on track when they’re side-by-side seems understandable. 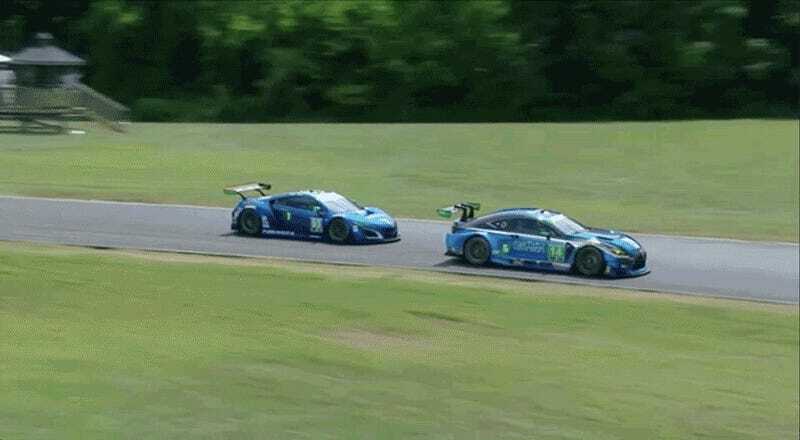 It’s a tight squeeze for both times, but that’s racing. At least there weren’t any walls to hit when Karam went two wheels off track to get around Legge. Even after that, there’s no reason to brake check someone twice as Karam did, such that Legge’s hood popped open like a big carbon-fiber parachute after the last hit. Karam was given a sixty-second stop and go penalty by race officials for avoidable risk. To solidify his position as King of All Jabronis this weekend, Karam then didn’t know where to serve his penalty and spent ten seconds waiting in the wrong location, spinning his wheels to get to the right spot when he realized he’d screwed up. Sadly for Michael Shank Racing, who runs Legge’s No. 93 Acura NSX GT3, both their the No. 86 and No. 93 NSXes did not finish the race. The No. 93 was forced to retire shortly after this incident, and the No. 86 was involved in a crash with the No. 3 Corvette. Oooooh boy. Something tells me “talk” isn’t entirely verbal. I’ve also never seen dirty tires have patches of grip and speed quite like this, so we’ve since reached out to IMSA for clarification as to whether Karam braked or not, and will amend the story when we hear back.